Boniface is justly called one of the “Makers of Europe.” He was born at Crediton in Devonshire, England, about 675, and received the English name of Winfred. He was educated at Exeter, and later at Nursling, near Winchester, where he was professed a monk and ordained to the presbyterate. Inspired by the examples of Willibrord and others, Winfred decided to become a missionary, and made his ﬁrst Journey to Frisia (Netherlands) in 716—a venture with little success. In 719 he started out again; but this time he ﬁrst went to Rome to seek papal approval. Pope Gregory the Second commissioned him to work in Germany, and gave him the name of Boniface. 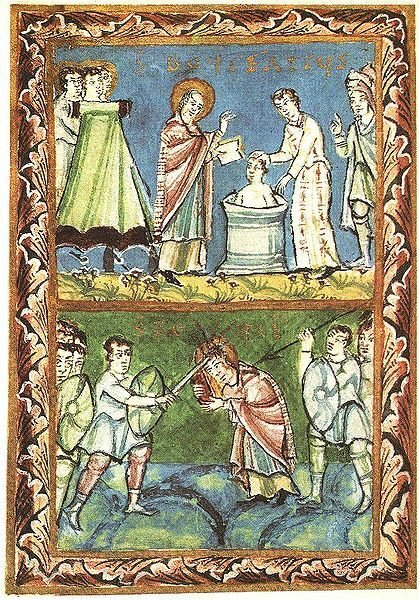 For the rest of his days, Boniface devoted himself to reforming, planting, and organizing churches, monasteries, and dioceses in Hesse, Thuringia, and Bavaria. Many helpers and supplies came to him from friends in England. In 722 the Pope ordained him a bishop, ten years later made him an archbishop, and in 743 gave him a ﬁxed see at Mainz. The Frankish rulers also supported his work. At their invitation, he presided over reforming councils of the Frankish Church; and in 752, with the consent of Pope Zacharias, he anointed Pepin (Pippin) as King of the Franks. Thus, the way was prepared for Charlemagne, son of Pepin, and the revival of a uniﬁed Christian dominion in western Europe. In 753 Boniface resigned his see, to spend his last years again as a missionary in Frisia. On June 5, 754, while awaiting a group of converts for conﬁrmation, he and his companions were murdered by a band of pagans, near Dokkum. His body was buried at Fulda, a monastery he had founded in 744, near Mainz. I Almighty God, who didst call thy faithful servant Boniface to be a witness and martyr in Germany, and by his labor and suffering didst raise up a people for thine own possession: Pour forth thy Holy Spirit upon thy Church in every land, that by the service and sacriﬁce of many thy holy Name may be gloriﬁed and thy kingdom enlarged; through Jesus Christ our Lord, who liveth and reigneth with thee and the same Spirit, one God, for ever and ever. Amen. II Almighty God, you called your faithful servant Boniface to be a witness and martyr in Germany, and by his labor and suffering you raised up a people for your own possession: Pour out your Holy Spirit upon your Church in every land, that by the service and sacriﬁce of many your holy Name may be gloriﬁed and your kingdom enlarged; through Jesus Christ our Lord, who lives and reigns with you and the Holy Spirit, one God, for ever and ever. Amen. New Hebrew reading: This seems an appropriate reading for him. Bio: He needs a ‘Why he is important’ statement. He was’justly called’ a ‘Maker(s) of Europe.’ What does that mean? By whom? I hate to steal your line, Michael, but… a TWO verse OT reading? About the “makers of Europe” line — I don’t think the reader can make much of it in its present location at the head of the article. It started me off with nothing more than a “Huh?” If it’s worth keeping, it would mean more after his contributions have been mentioned — maybe at the end of the article (with suitable adaptations in wording ) or as the closing the penultimate paragraph. Other than that one point I felt the narrative flowed nicely and presented his life and ministry in quite a positive (even inspiring) light. Thank you! So many of these brief biographies seem written for an exclusive audience — those with an advanced theological and liturgical education at an arrogantly self-righteous, holier-than-thou seminary, which may eliminate even some of the accredited Episcopal Seminaries. I believe that the audience is and should be the average lay person, with a typical, secular, general education. Accordingly the use of terms such as “presbyterate” and “see” will have no meaning for most of them. I once listened as a college-educated senior warden read one of these biographies as a meditation before a vestry meeting. She unwittingly changed “ordained a presbyter “to “ordained a Presbyterian” and shrugged her shoulders to acknowledge that it made no sense to her why a Catholic Bishop first had to be ordained in another denomination that did not exist at the time he lived. I also believe that all (not just some) references to ancient places, nationalities, ethnic groups and the like should also be identified by their current names, perhaps in parentheses. The problem is the serious decline of any sort of understanding of history in “typical, secular, general education. ” One of the reasons why we send clergy to Seminary is so they can bring their education to the laity. While that seems to be a frowned upon, or resented, idea, I think it still informs this discussion. In the collect, this phrase sounds acquisitive — “collect the whole set” — as if God is an avid collector, rather than expressing the idea that God is our eternal hope and destiny, our source of life, blessing and fulfillment. Would it be more inspiring to state here something that expresses God’s eternal purpose and God’d benevolent will for his people, rather than simply declaring “who” those people belong to? (I realize that much more than “property rights” are implied by saying “you raised up a people for your own possession,” but explicitly, in its literal denotation, it’s a statement of ownership and property. Saying it that way strikes me as missing the opportunity for a richer expression of the importance of Boniface’s life and work, and of God’s work of redemption through Boniface’s faith and ministry. But, God is an avid collector. Doesn’t the Good Shepherd go hunting the lost one because the set is incomplete? Any reason not to push to Micah 4:1-5? It’s all quite lovely and that’s more of a sense break in the chapter. Boniface’s role as “maker of Europe” seems to be mostly the product of late 20th century West German and Roman Catholic wishful thinking. the Germans promoted him as a sort of a super-Bismarck, and the Catholics as an anti-Luther. It’s hard to make the jump from the facts of his life — holy and productive though it was — to Konrad Adenhaur’s “What we have in common in Europe comes from the same source [Boniface].” Significantly, the Catholic Encyclopedia (1913) makes no such claims. It seems to have been the habit of the Bishops of Rome of the period to rechristen missionary bishops, at least the Anglo-Saxon ones. Wilibrord was renamed “Clement” by Sergius I, but we still use his original Anglo-Saxon moniker. I suspect that the renamings were to give them proper saints’ names, as both were already monks when they were renamed. If we can’t give her her own date, Boniface’s bio should at least mention his intended tomb-mate Leoba (800-870). Her missionary activities, as well as those of her nuns, among the Frankish and German womenfolk were at least as significant as Boniface’s work with the men. Despite (or perhaps because of) Leoba and her sisters’ success, more than one thousand years would pass after her death before the Roman Church sent out another female missionary. Boniface is a significant missionary figure, There is no reason not to keep him as in LFF. The OT reading may only be two verses, but what it saya in worth hearing. Delete the reference to his being Archbishop of Mainz in the subtitle. This fact appears in the text of the bio.